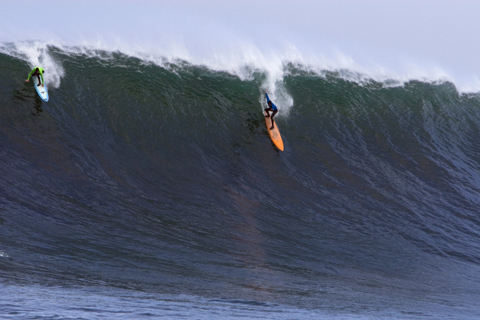 This year marks the 25th anniversary of the Quicksilver In Memory of Eddie Aikau big wave surfing event. The longest-standing big wave event in the world, it honours the legacy of fearless Hawaiian charger, Eddie Aikau, who was the first lifeguard at Waimea Bay. He died tragically in 1978, at the age of 33, during a recreation of the Polynesian voyage between Hawaii and Tahiti. The double-hull canoe he was travelling in overturned in huge seas in the Molokai Channel and he attempted to swim to land to get help for the rest of the crew. He was never seen again. This is the Olympics of big wave surfing. Held at Waimea Bay, it brings together the finest hellmen from around the globe, who wait throughout the winter months of December through to the end of February for the contest green light. Due to a minimum wave height requirement of 20-foot Hawaiian (that works out to 40-foot faces for non-Islanders), it has only run seven times since its inception. So why should you care? Because, after years of being neglected and overlooked by the global surf industry, a bunch of SA big wave surfers have their best chance yet of being invited the event. The SA contingent are among some of the best big wave surfers in the world, having made their mark on the international scene through 10 years of competition at Dungeons, outside Hout Bay. To send some of them to Hawaii all you need to do is get online and vote. There is a list of 134 nominees. You can pick up to 24 invitees and 24 alternates. This poll isn’t the final say as to who gets invited, but it will have an impact on the panel’s decision. Andrew Marr, Barry Futter, Charles Reitz, Chris Bertish, David Smith, Frank Solomon, Grant “Twiggy” Baker, Ian Armstrong, James Taylor, Jason Ribbink, John Whittle, Michael Schlebach, Mickey Duffus, Sean Holmes, Simon Lowe, Thomas King-Kleynhans. Image: James Taylor and Grant “Twiggy” Baker share the drop at last year’s Red Bull Big Wave Africa. Hey Timmy, my bad. Dammit – was up when I wrote the piece two days back. Too late she cried! Ok…watch this space and we’ll let you know who makes the cut….